Take a moment to feast your eyes on such cleverness. 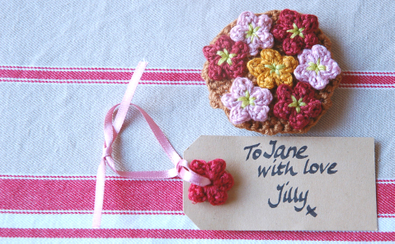 Perfect crocheted posies and the sweetest label. Some people just have the 'knack' don't they? Jilly's blog is like looking at everything I have wanted to do but haven't gotten around to yet (which happens to be the story of my life!). It's the knitted flowers that I particularly admire as yes, I have bought the book but have yet to try any. Jilly has knitted all hers without the book! Thank you, Jilly, for sharing your cleverness! I love my posy! Since I have been back I had a terrible migraine so I have had to write off the last 3 days. I'm hoping when I wake tomorrow I wont have to take an injection and it has gone and I can do all that I planned to do in one day! Let's hope!